A controversial provincial city mayor in the Philippines known for parading drug suspects in public was shot dead during a flag-raising ceremony on Monday. 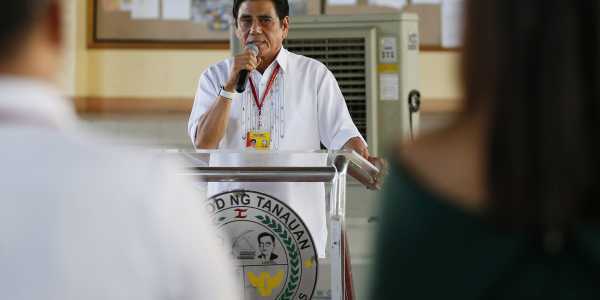 Tanauan City Mayor Antonio Halili was declared dead on arrival at a hospital from a single bullet wound to the chest, sustained as he and civil servants sang the national anthem during a ceremony in city hall in Batangas province southwest of Manila. Police Superintendent Renato Mercado told CNN that a video showed scenes of panic seconds after the shot was fired. Halili was seen standing in a line with government employees as the flag was raised. Suddenly, a single shot rang out followed by screams and chaos. The police official said Halili was killed by a sniper. Another investigator told a radio station that a high-powered rifle was used in the attack. The mayor had gained prominence for implementing a “walk of shame” for drug suspects in 2016 where he paraded them for people to see and then in 2017 when he was linked by the government to illegal drugs. Gerry Laresma, the government employee who shot the video, told PNA that Halili had received death threats because of his strong anti-crime push. “We are shocked, we are saddened,” Vice Mayor Jhoanna Villamor, who was standing next to Halili, told radio station DZBB after the shooting. Philippines National Police Chief Director General Oscar Albayalde said a regional special task group had been convened to investigate the killing and that the suspect parades were being considered as a motive. Presidential spokesman Harry Roque condemned the killing, saying that Halili was an ally of Rodrigo Duterte and that justice would be served.